Women in any profession have to walk a tightrope of trying to look professional without any clear guidance on what that means exactly. Unfair perhaps, but reality none-the-less. It is much easier for men where wearing a black or navy suit, even when poorly fitting, will signify power and respect. Even business casual is defined for men as being a blazer worn with a relaxed shirt, no tie and chinos. Essentially men have a clear uniform they wear and which instantly makes them part of the club. It is internationally recognised and so ubiquitous that we don’t even think about it allowing us to focus on the message of the wearer. Conversely, there is no standard uniform for women, which means some women struggle to navigate the corporate dress code appropriate to their role, where details such as hem lengths can make or break the rules. Whilst I don’t think there is a one-style-fits-all outfit for women, I do believe that developing your own personal uniform is important. And this is where female politicians such as Angela Merkel and Nicola Sturgeon excel. They have both found a style that works for them and which allows them to project a consistent and clear message to their audience. 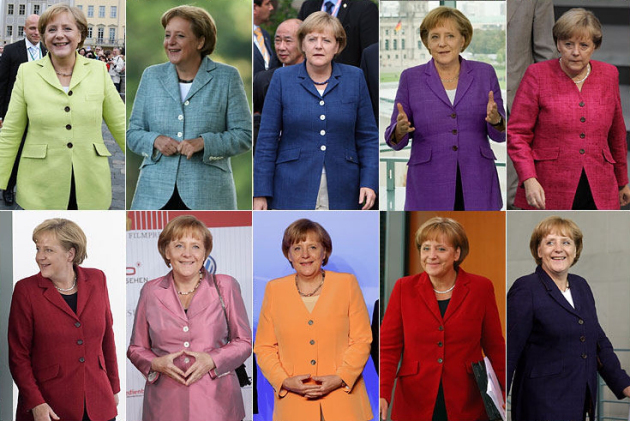 Think of the German chancellor and you immediately have an image in mind of a woman in a colourful blazer paired with contrast colour trousers. You barely waste a thought as to what she is wearing and immediately move on to think about what she has to say. Similarly Nicola Sturgeon has become known for her colourful skirt suits. We know what to expect from her style before we see an image of her. 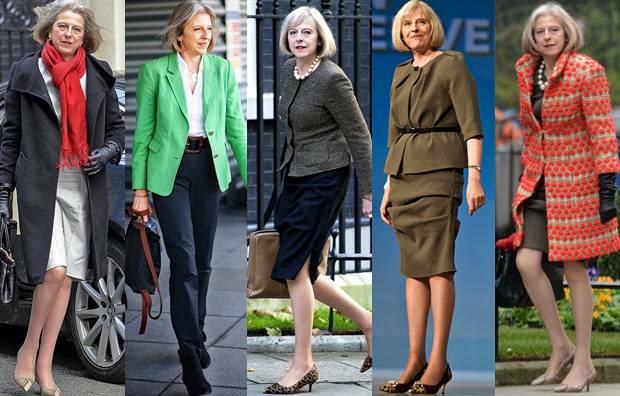 Theresa May on the other hand clearly likes to experiment with different styles, colours, patterns, etc. A quick image search on Google confirms that her looks vary greatly from trouser suits, to skirt suits to draped dresses and so on. Whilst I applaud her interest in fashion and willingness to take risks with her outfits I think the sheer variety of her looks sends mixed messages to her audience and has the potential to make her look confused. Going back to the idea of developing a uniform for the work environment I believe Theresa May would benefit from creating a signature look that works well for her and which can then fade into the background letting her politics and message come to the fore. Essentially this is what the suit does for men and it is important that women in leadership roles get equal recognition for their voices and less commentary for what they are wearing. The term uniform is perhaps unfortunate in that it implies a boring outfit. I don’t think that needs to be the case as this article shows. A signature style can be fashionable, but at the same time consistent which then allows it not to dominate the conversation. I’d like to clarify that it is not my aim to slate Theresa May for having an interest in fashion, nor criticising her for how much money she spends on an outfit as others have done. That to me reeks of double standards considering that a bespoke suit, such as most male politicians wear, will easily cost upwards of £3,000. Rather I see her as an example of the difficult position women in leadership positions find themselves in and how important it is to develop a consistent style that works for her and will then allow everyone to stop talking about it. What will remain in people’s minds is a woman who knows what she stands for rather than a woman who is veering from one look to another. What are your thoughts on the idea of a work uniform? Do you have one? Do you think it a help or a hindrance? Are you confused about what is acceptable where you work? What are the guidelines your employer sets out for you? I’d love to hear your thoughts in the comments. Teresa May is wearing some truly dreadful outfits in these pictures! I think she occasionally gets it right. My daughter works in Harvey Nichols style concierge – it’s nothing that they couldn’t sort out for her! I agree – some of her choices are questionable. She also looks great in some pieces – I think it’s about eliminating those looks that don’t work and keeping the ones that do rather than reinventing her style. Interesting article. As a woman in a leadership role, I have indeed thought about my ‘look’ at lot. What message do I want to give my audience? Honestly, I have the ambition of being smart, wearing a clean cut suit (rather like Nicola) which is sharp, elegant, simple and says ‘I mean business’. One of the massive issues I have is that I don’t have the budget for bespoke and the high street really fails to deliver for those us who are on the slightly larger side. M&S and most recently Principles has come close but I am yet to find that groove, style and look I’m happy with. Thank you for sharing your thoughts, Yvonne. Your experience of a lack of choice on the high street is a common complaint. Even for women of a smaller size there seems to be little in the way of smart tailoring available. Short of going for a bespoke option the best I can suggest is finding something reasonably well fitting and then having it altered to improve its fit and look. You might be surprised by how much can be achieved with a few simple tweaks. One point to make here is that you should try to find well fitting shoulders – they are the hardest (and most expensive) area to change.